No particular patterns emerge with this FM. Some 5th harmonic and 7th harmonic activity is present but is mostly disorganized. You will have creative energies and insights with this FM, but organizing them will be a challenge. Any of a number of interpretations can be had, but the one I see is that the strife in Portland will continue. The center of the United States is VERY active. I would not be surprised to see Amazon pick a city near these lines for the new center that is being discussed. PISCES – VIRGO FULL MOON with NEPTUNE (Sept 6) – We’re ALL (in) THIS! The Piscean Unification Full Moon! In the Music, in the Smoke. In the Wave of it all. How can we fix and RE-solve this or that….? Maybe it’s more (ALL!) about being in the Vibration of LOVE. After Fullness, the MOON will pass CHIRON in late PI, just before midnight PDT Sept 6. ‘Healing’ happens, or at least things come into flow again, through empathy and connectedness. No fixing of faults, but being with what IS and with who they ARE. Here’s a beautiful video that RE-emerged for our CHIRON Archetype group this week. Working with the natural cycles of the heavens and the phases of the moon is like working with a master gardener – learning when to plant (or sow), and when to release (harvest or let go of). The natural pulse will support you in facilitating the change you desire. Swimming through the Virgin’s Sun. which make up September’s breeze. It is time again for their cyclical death. First, a promise to return. Green becomes red, orange, and yellow. 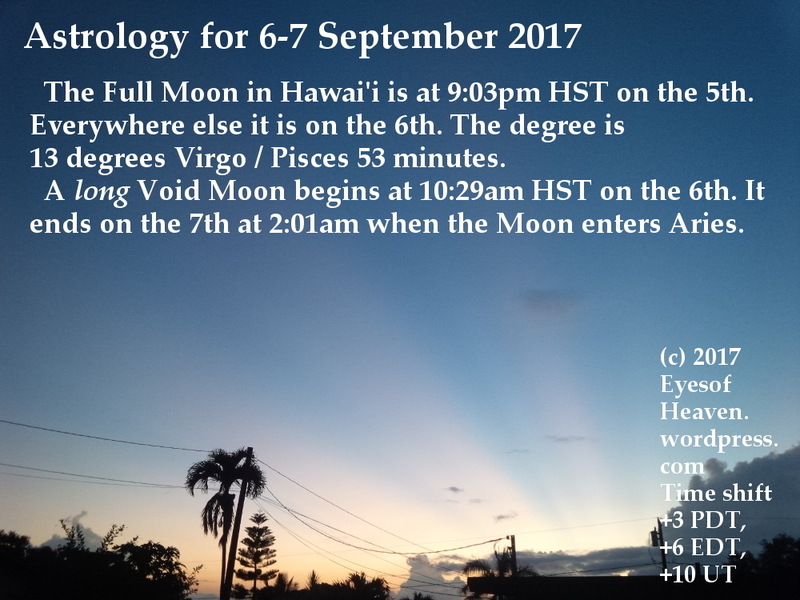 Full Moon in Pisces, 6th Sept, 2017! Full Moon in Pisces conjunct Neptune! Full moon time, Sun and Moon opposite each other, happens every month. And I gotta say for this one I’ve got nothing!, sorry about that, so my thoughts and feelings are this. Go with the Pisces theme, Pisces rules the 12th house, house of endings, the end. Neptune rules Pisces which is conjunct to Moon. Let go, take a step back, let yourself just detach and be, for a few hours or days that the energy of Pisces is around. Come back to yourself, get lost in the everyday, mundane things, focus on the here and now for a moment, and when you can dream the dream, use your imagination, chill, and the big Pisces one, trust and love, take a look at life from the higher perspective, get a higher view of the bigger plan, the universal plan.